If you think fake gold coins are something you’ll only ever see on the silver screen when bad guys double-cross each other in a heist film, think again. According to both the Professional Numismatists Guild and the American Numismatic Association, there has been a significant increase in the number of fake gold coins popping up in the marketplace in recent years. What’s worse, the counterfeiters are now using highly sophisticated production methods that make it more and more difficult to spot the phonies. 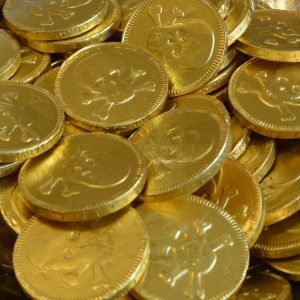 A majority of fake gold coins come from China and take the form of perennial bestsellers like American Eagles, American Buffaloes, and Canadian Maple Leafs. The coins are typically purchased in bulk from unscrupulous individuals or dealers, and then sold as genuine gold to unsuspecting consumers via eBay, Craigslist, flea markets, and pawn shops. And since local law enforcement often lacks the means (or will) to thoroughly investigate transactions involving bogus gold, the buyer is stuck with a huge loss. Limit your transactions to reputable dealers. When buying online, choose a dealer from the United States Mint’s list of national retailers and also check for BBB accreditation, TRUSTe privacy certification, and similar memberships and endorsements. In addition, be sure to check out verified consumer reviews on third-party websites such as TrustLink.org to read about other buyers’ experiences. Learn how to spot fake gold. If your transactions primarily occur in person, then it would be well worth your time to learn how to spot fake gold. From acid testing to weighing the coins, inspecting the fonts, and scrutinizing the design details, the more checks you can perform the less likely you’ll fall victim to a scam. Don’t let greed get the best of you. Sometimes there’s no better advice than simply heeding this old adage: If it sounds too good to be true, it probably is. So when you see someone offering gold coins for a very low price, do yourself a favor and walk away. Most of the time cheapest doesn’t represent the best deal. Fake gold is a regrettable reality in today’s high-tech world, but avoiding problems is relatively easy for vigilant investors. It mostly comes down to knowing who to trust, so stick with established firms like American Bullion for smooth, hassle-free transactions every time.